One of the shocking realisations that I had during my trips to Polytechnics was the overwhelming presence of discipline and ethical issues amongst Polytechnic students. Most polytechnics were grappling with a high level of student indiscipline and unruly behaviour. More than the academic and operational challenges, the student discipline issues pose the biggest challenge to the faculty, management and the institutions. "This student has been dismissed from the institution since he was found in a fully drunken state in the classroom on ..........". On further speaking to the Principals, this seems to be a major issue across many Polytechnics. The Principals and faculty attribute this to the family background. Most of these students take up drinking seeing their father. In most cases these students come from families where the father happens to be a habitual drinker. The second major issue noted amongst Polytechnic students is the unruly nature of many students. Sometimes such unruly behaviour also results in violence. Cases of one student beating up the other seem to be common amongst several Polytechnics in the country. In some colleges, I came across teams of Police personnel investigating a violent incidence involving either individual or groups of students. Such behaviour is most often attributed to broken families of the students. In many cases the father might be a violent person, thanks to his drinking habits and the student learns from his behaviour. Whatever be the issue, the challenge of discipline and violent behaviour can not be addressed without the active involvement of the parents of such students. However Polytechnics do not seem to address this issue other than just by admonition or punishment. In one of the colleges that I visited, one of the students who had hit another student was being admonished by a group of 5 people without even listening to the student's feelings. This admonition session went on for nearly 3 hours. If colleges believe that they can change students for the better with such measures, they are badly mistaken. Surprisingly, none of the Polytechnics that I visited had a Psychological Counsellor! Knowing well that these students come from challenging family backgrounds, the colleges must be focusing on offering counselling services to these students. All the student needs is somebody who will listen to them patiently, support them through their difficult times and provide them the much needed direction. It is not sufficient that these colleges provide only technical education. They must also rise to these challenges and ensure that their students pass out as technicians with a strong value system. Ultimately, a value driven work force can make a world of difference to not just the individuals but to the nation and its development too! The untapped resource pool for software companies: The Polytechnic Education Saga! It is a common knowledge that there are huge class differentiators across the Indian education system. The class differentiators that I am referring to are the ones that are created by the student's examination scores. For example, it is a common belief in Tamil Nadu that a student has to secure a high percentage score in his 10th standard to join the Science stream in 11th standard. In engineering colleges, computer science stream has the highest cut-off and is the most sought-after. Hence only the top-scorers in 12th standard or the entrance examination gets to join computer science engineering. Similarly, the Polytechnics too have their own class divide. While computer science is the much sought after branch in engineering colleges, it is also the least in demand across polytechnic colleges. Althought it is heart-warming to see that the mechanical and automobile branches are the most sought-after in polytechnic colleges, it is also disappointing to see the low interest and enrolment levels in the computer science branch. Most polytechnics across the states of Tamil Nadu and Karnataka have seen declining interest in enrolling in the computer science branch - this despite a comparatively low fees vis-a-vis mechanical or automobile branches and a vibrant IT industry existing in both Tamil Nadu and Karnataka. However, a little more probing reveals much more and throws up a few interesting questions. Traditionally, old economy sectors such as manufacturing, automobile and electrical have been ably supported by the talent pool that emerges out of polytechnic colleges. The demand for such talent continues to exist and polytechnics manage to groom their students ably to meet this demand. With immense placement opportunities across these sectors, it is no surprise that polytechnic students make a bee-line for a Diploma in these branches. However, the new age sectors such as electronics, IT and computer science have been depending heavily on the engineering colleges for their talent requirements. While the electronics and the IT hardware sectors have started exploring the polytechnic talent pool, the software sector continues to be hesitant in recruiting polytechnic diploma holders. Since placement opportunities for polytechnic diploma holders in the software industry are very limited, students do not find it lucrative to pursue a Diploma in Computer Science. In the absence of placement opportunities, the only other option for such students is to pursue an engineering degree in computer science. However, the prohibitive costs of an engineering education (especially in the most sought after branch of computer science) forces polytechnic computer science diploma holders to drop out of the education system itself. These students end up doing data entry and DTP work in smaller towns and cities without much scope for a software career they dreamt of. On the other hand, the reasons for software companies to be hesitant in recruiting polytechnic diploma holders are many. One of the prominent reasons is the limited exposure that a computer science polytechnic student has. For all practical purposes, what a polytechnic student covers is equivalent to just the first year of engineering. Although they may have a higher level of practical exposure in polytechnics, the limited breadth of exposure acts as a major deterrent. Secondly, polytechnic students' communication skills (particularly spoken and written English) or lack of it also acts as a major deterrent. Thirdly, the maturity level of polytechnic diploma students are perceived to be much lesser than engineering graduates and hence unsuitable in this knowledge based industry. In response, many polytechnics have already started addressing these issues through continuous training programmes on both technical and soft skills areas. The polytechnic diploma holders may lack the breadth of knowledge but are traditionally considered to possess a better hands-on knowledge of the domain. I am sure the IT industry can learn to utilise this hands-on knowledge for their benefit. With the IT industry constantly lamenting about the poor quality of engineering graduates, it might be the right time for software companies to seriously consider recruiting from the diploma talent pool.While being young can mean a higher level of immaturity, it can also indicate a higher level of mould-ability, unlike engineering graduates who come with a heavy 'baggage' and are reluctant to 'unlearn' and 'learn'. 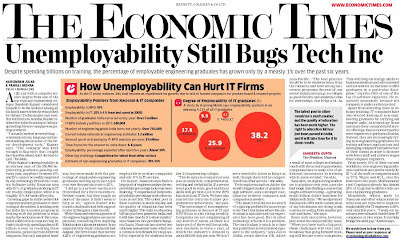 Employability of Engineering Graduates is still a huge issue bothering the Indian IT sector. It is time that the software industry starts expanding its talent sources to include this young and untouched resource pool. A handful of companies have already started tapping it but the roles they offer are largely tech-support or customer service. It is only fair on the industry to start inducting the diploma holders into full-fledged coding and programming roles.A hands-on training programme as part of the induction process will ensure that these diploma holders are as good as the engineering graduates. Apart from looking at this resource pool from a business productivity perspective, companies must see the social perspective of such a move. Considering the poor economic background of many of the polytechnic diploma holders, such a move by software companies can have a strong positive impact on not just the life of the student but also the entire societal system surrounding him/her. Will software companies start seeing sense in tapping this resource pool? Will there be a positive change in the lives of many polytechnic diploma holders who pursue their education with nothing but just a dream in their mind? Over the last few days I have been travelling extensively to a lot of Polytechnic colleges across the country. I have been trying to introduce a radically different career opportunity for the Diploma Holders who wish to join the Indian IT industry. These visits are an eye-opener for me as many of my long-held beliefs about the state of Polytechnic education have been changed. This series of notes that I am posting here are entirely based on my true experiences. I have tried to raise a few questions and I do hope we see answers to these in years to come. I have visited nearly 35 polytechnics in Tamil Nadu last week, a few of them are Government run and many of them private / self-financing. I had the opportunity to interact with several categories of people including the Principals, Head of the Departments, Placement Officers and students themselves. While it is heartening to see so many polytechnic colleges across the state, the reality that exists within takes different hues. One of the fundamental questions for which I was looking for an answer was - "Why do students join Polytechnic colleges?". As an outsider, I have always thought that Polytechnics provide a lot of hands-on training to students thereby preparing them for a strong technical career in the engineering sector. They also take a student to the employment market much faster then any other course. I also believed that students who do their Polytechnic Diploma perform better when they join the undergraduate degree in engineering due to their increased exposure to practical training. Hence, my curiosity was to understand if these are the true motivators for students while they are enrolling in Polytechnic colleges. Unfortunately, the motivation behind enrolling in Polytechnic colleges are nowhere near my beliefs. Broadly, there are two categories of students - the haves and the have-nots. The 'haves' come from middle or higher income families while the 'have-nots' come from lower middle, lower income or sometimes even from BPL families. The motivators for each of these categories are different. For the 'haves', Polytechnics serve as an easier and cost-effective route to Engineering colleges while also addressing the issue of low scores in their 10th standard. A Polytechnic is an easier way to join an Engineering College: A lot of students who do not want to be in the rat race for an engineering college seat after their 12th standard, opt for the Polytechnic route. The pressures are lesser since the competition is also much lesser. The possibility of lateral entry into 2nd year engineering is much higher since most private colleges admit based on the amount of donation one can give. The donations to be given to engineering colleges is much lower at the lateral entry level when compared to first year engineering seat admissions. Plus they save a year's engineering college fees which is sometimes 10 times as much as a Polytechnic College's fees. Lower score in 10th standard: Students who score less than 50% in their 10th standard do not usually get science stream in their 11th & 12th. Without science in 11th & 12th, they cannot apply for an engineering seat. Polytechnics are the next best option since admission to most private Polytechnics is not based on merit but largely based on the ability to pay a higher fees and donation. For the 'have-nots', the need for quicker employability and inability to afford higher education are the key reasons to join a Polytechnic. The need to start earning: A lot of students in this category come from needy families and there is tremendous pressure on them to start earning. Hence, they cannot afford to wait for 5 to 6 years (to complete a graduation) to become employable. Polytechnics make them employable in 3 years and hence are best suited for this category of students. Low affordability of higher education (BE / B.Tech): An Engineering education is an expensive proposition. For those who cannot afford an Engineering education, Polytechnic is the next best option to prepare them for an employment. While the original objectives of setting up Polytechnics would have been to prepare a skilled workforce for Indian industries, sadly only a handful of students join Polytechnic with an objective of learning those skills. Unfortunately, Polytechnics in India are chosen by students out of compulsion, not out of passion; and this reflects on the poor quality of output from Polytechnic colleges. Until a Polytechnic course becomes a study of choice, it is left to the industry to train them and employ them. Do share it with all your friends and spread the word around! I have been thinking about starting this blog for a long time. After closely working with learners ranging from school dropouts to working professionals, I felt that there is a strong need for a guiding light that could help learners from all walks of life clear the dense fog of the career maze. I am starting this blog today, to purely address this need. Do I know enough to offer career guidance? I don't claim to know it all! But, I am going to count on many of you - my mentors, my teachers, my colleagues (and ex-colleagues), my batch-mates, my friends, my family and my students - to make this blog a meaningful one for those who need career guidance. I envision this blog to be a dialogue of sorts between those who have 'been there, done that' and those who 'want to be there and do that'! For all those who wanted to contribute towards helping me in my educational social entrepreneurship assignments, I appeal to you to share your thoughts on this blog. You never know - one statement of yours on this blog can probably have a profound life-changing impact on some student somewhere in the world. Every day, I intend to post a guidance note. I would like to call each one a lamp post! I intend each lamp post to dispel some darkness related to career. Initially, I would keep them focused on undergraduate & post graduate students but subsequently, I intend to include early career guidance to working professionals too. If you find the lamp posts useful or if you feel that these lamp posts can dispel the darkness caused by career confusion in somebody's life, I earnestly urge you to share them freely. You never know - one 'share' (be it facebook, linkedin, google + or digg) from you can make a world of difference to some student. Comments and feedback are always welcome. But what I would like to see more of is contradicting view points. There are no right or wrong answers in this world. Everything depends on the perspective in which you see an incidence. I am not here to claim what I know or profess to be the only solution. What I am writing here is based purely on my personal experiences and hence based on a particular perspective. I firmly believe that there are other perspectives too and I urge you to share these contradictions openly. You never know - one contradicting view point from you can offer a better choice to some student. I dedicate this blog as a step towards achieving one of my dreams - a dream to see a truly skilled India where everyone chooses a career out of passion rather than of compulsion; because only then can excellence become a habit in this truly disruptive age! I dedicate this blog to building a skilled nation! Are you with me in this nation building exercise? I bet you must have thought about Rabindranath Tagore when you read the title of this post! If you did not, then you probably did not attend a school in India! I am indeed referring to the famous poem by Rabindranath Tagore from his most famous work 'Gitanjali' published in 1912. This is more a prayer than a poem to me and this has been playing in my mind for the past few days. With my limited memory power, I could only remember the first two lines and the last line (which is what most people remember). Hence, today, I decided to read through the entire poem to see if there is a new meaning in it; if there is a different perspective to the whole poem. The poem was no doubt a vision for the India that Tagore envisioned and it was quite apt during the pre-independence circumstances. Reading through the poem now, I see an even higher degree of relevance of the poem today. I tried looking at it from an education perspective in today’s new digital world and I am amazed at how relevant this poem is even today. Take a look! However, the Indian education system instills exactly the opposite in every Indian student – a fear of failure. I am amazed at how the fear of failure is religiously taught to every child right since the kindergarten. As a child, most of us are born fearless; we do not mind trying out something new; we try and experiment with anything that ignites our curiosity; we do not know whether it is useful or harmful but we still try it. In short, as children, we are not afraid of failures. The problem begins when we start schooling! The school and even the family system instills this fear of failure in every one of us; we are afraid of failure in our school exams; we are afraid of failures in entrance examinations; we are afraid of failures in assignments, projects, activities; the list is endless. More than fear of failure, we develop an even worse fear – the fear of being wrong. By admonishing any failure, the education system further alienates us from any creativity. Because you are afraid of failures, you progressively stop doing things differently; you stop trying new things; you inhibit your creativity! As a result, most of us end up as average employees all our life, afraid to take risks and afraid to go that extra mile that can differentiate us from mediocrity to excellence. I am sure many of you can relate to what I am writing about! Now, the first statement of Tagore’s poem sounds so relevant! As long as our minds are with fear, our heads can never be held high. This is a clarion call to ensure that we do not let our kids go through the same. Encourage them to experiment; let them end in failures; do not punish them or ridicule them; do not force your ideas and thoughts on them; let them develop their own view of the world; let them try and be what THEY want and not what YOU want them to be! India will then definitely be a better place. Knowledge must be affordable; much better if it is free. Thanks to the internet technologies, the world is increasingly moving towards an open knowledge society. Google and Wikipedia must have educated more people than the combined number of people all the world’s Universities educate. Knowledge is no more measured by the number of books you have read but by the amount of gigabytes of data you have browsed on your computer. We are in the midst of an unprecedented digital revolution and this is just the beginning. Thanks to advancing mobile technology and the reducing costs, I will not be surprised if 5 to 7 years down the line people learn primarily through mobiles, anytime anywhere. In fact, such a possibility already exists in several developed countries. Several such initiatives are already underway in India too. With so much information and knowledge available in the digital world, Tagore’s vision of knowledge being free is closer to reality than ever before. The internet and other media technologies have made nation’s borders irrelevant. We are living in a borderless world where exchange of information and knowledge is much easier and faster than ever before. Global research projects that transgress multiple national borders are the order of the day. Student and faculty exchanges across various Universities around the globe happen regularly. Thanks to advancing telecommunication and educational technology, a professor sitting in his house anywhere in the world can address students simultaneously across all 7 continents. Education has truly become global and soon learning too will become universal. Free and true knowledge must also lead to greater transparency. Today’s world is obsessed with transparency and demands it from every aspect of public service. In the absence of transparency, we have a Wikileaks to source and publish this information. If such free knowledge and transparency helps in improving processes and public services, then they must be welcomed. Truth, however bitter, must be welcomed and accepted. The world is undoubtedly worried about the growing number of scandals that have happened due to unethical practices. In response, educational institutions, especially b-schools are taking a deeper look at their curriculum to incorporate better business ethics components. It is not just business schools, but the entire education system across the globe that must delve into its teaching curriculum and methodology to ensure that ethics is not just taught as a drab subject named “Moral Science” or “Business Ethics” but is actively practiced by the students. Only then can ‘words come out from the depth of truth’! The word ‘perfection’ reminds me about the 1986 Ron Howard Movie - “Gung Ho”. It is a must-watch movie for business school students and people who work across cultures. The movie vividly portrays the challenges of cross-cultural communication through interactions between a Japanese management and an American work force. One of the highlights of Japanese culture is their willingness and ability to strive for perfection in whatever they produce. They will never give up until they have the perfect product and that is precisely why Japanese products are much superior world over. It is ideally this level of perfection that Indian educational institutions must strive for. Educational institutions have a direct role to play in nation building. If Indian educational institutions strive tirelessly to shape each student to become a world class product, then excellence becomes a habit and not an exception. For the younger generation, aiming for perfection must be a skill that must be taught at home and at school. The infamously Indian “chalta hai” attitude will not “chalega anymore”! Work with your kids to teach them perfection in whatever they do. This has to be imbibed right since early childhood if we intend to prepare India to lead the world. I recently read a note on the management guru Tom Peters' blog about the inability of Asians to develop creativity in their kids whereas the Americans find it difficult to suppress their child's creativity. He also goes on to mention this as the reason why America has produced so many entrepreneurs and Nobel Prize winners compared to Asia. I am not sure if he includes India in his reference to Asians but I was surely shocked! Keeping all subjectivity aside, I wondered if there is an iota of truth in his statement. In India, learning by rote (also called learning by heart, mugging up, memorizing etc.) is a very common practice with schools and children. Even now my Mom ridicules me about my habit of memorizing solutions to Mathematics problems during my school days. Honestly, our school system encouraged rote learning and left very little for application and creativity. You disagree? Let me test you! Answer the following question. You have 30 seconds. You are driving down the road. At a traffic signal, the red light blinks once in every 2 seconds; the yellow light blinks once in every 3 seconds and the green light blinks once in every 5 seconds. The question: In a minute, how many times will they blink together? If you have the answer, post it in the comments section first. Then, come back to read the rest of this post. If you don’t have the answer, continue reading. Now let me ask you another question. What is the Lowest Common Multiple (LCM) of 2, 3 and 5? Between these two questions, I bet most of you answered the second question easily. Some of you may also have realized that the first question and the second question are similar except that the first one is application based whereas the second one is concept based. You may also treat this as a logical googly question: how can all three lights in a traffic signal glow together? Unfortunately, many graduate students in India can neither solve it right nor figure out the googly in this question. Our schools have taught them the concepts well but have not trained them enough on applications. In other words, they have all learnt something that they neither know how to use nor where to use! This is possibly a reason why many students do not do well in research and business. Research and business, as you would agree, requires enormous amount of application of concepts and that ability is unfortunately missing in many of India’s graduate students. Institutions must review their curriculum and explore possibilities of incorporating a great deal of application orientation. For the number of PhDs that India produces, we must be developing enormous research insights that can have a phenomenal impact on several sectors. The absence of such an impact only confirms the poor quality of PhD research that is currently underway in Indian Universities. Such a system does not augur well for the development of Indian academia. Tagore’s statement is a warning bell for educational institutions. Such focus on rote learning without any application orientation across educational institutions will only bury the future generations in the dreary desert sand of dead habits. As parents, we must strive to keep our kids away from rote learning. Allow them to learn by doing and experimenting – you will be doing a great service to future generations. Education must always strive to expand the horizons for every student both in thought and action. Only such an education can lead us to our next freedom – a freedom that will make the whole world a single classroom and every student a global citizen. Tagore’s words are not just relevant in education. These words will have a strong relevance across all domains, be it business, politics, society or family. In fact, this poem is has eternal relevance. Such is the beauty of this masterpiece! I now see the true meaning of this poem and it will forever be etched in my memory. What does the poem mean to you? Read it in silence and you will be able to see the relevance. Now, do you relate to the poem? What do you see in it? Let me know! Quality standardization - the McDonald's way!